This building, very familiar to people today as the site of Pryde’s in Westport, played an important role in history. Miss Helen Thomes used it as her dance studio, teaching “joy of life and appreciation of beauty” to many young Kansas City women. This 1940 photo courtesy Kansas City Public Library/Missouri Valley Special Collections. 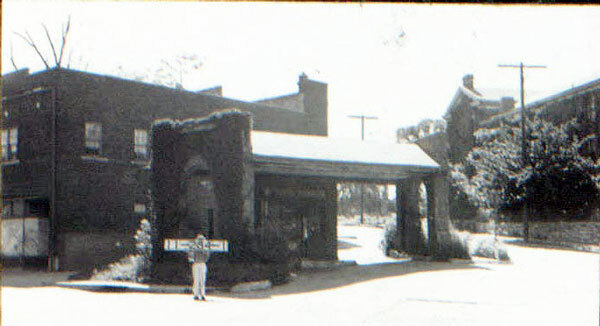 The front of the building in 1940. When the holidays roll around in Kansas City, many people head to Pryde’s in Westport, the “hardware store for cooks.” If they look closely among the spatulas and saucepans and dish towels, shoppers will notice a number of framed photos of young women in ballet and other dance costumes. They were all students of Miss Helen Thomes, a dance teacher who taught at various studios around Westport, including the building where Pryde’s is now located. Thomes came from an interesting early Kansas City family and definitely left her mark on the community when she died in 1958. Helen was the daughter of John E. Thomes, a civil engineer who helped build bridges around Kansas City in the late 1880s and laid railroad tracks as far west as Cheyenne, Wyoming. He died in 1893. After John’s death, Helen’s mother Fannie Thomes managed the Lyndhurst Hotel at 360 E. 40th. She was well-known as a Kansas City business woman and founder of the Women’s Exchange. 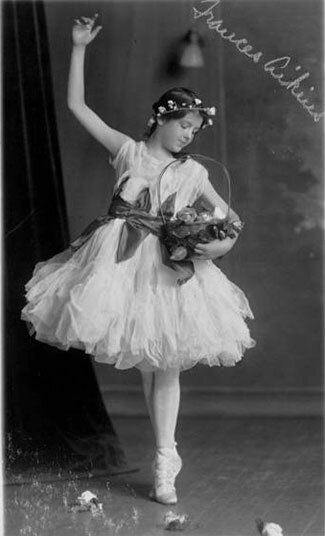 This photo is believed to be Miss Helen Thomes in dance costume. Photo courtesy Kansas City Public Library/Missouri Valley Special Collections. John and Fannie had five daughters, four of them teachers. Beatrice, who became Beatrice Cochran, even taught for a while in Puerto Rico from 1913 to 1955 while her husband operated a sugar company there. The first newspaper record of Helen Thomes comes in 1913, when the young woman was helping others in Kansas City learn the latest dance craze: the tango. The dance was wildly popular in New York and Chicago. On December 11, Miss Thomes taught Kansas City dancers the steps at the Hotel Baltimore. 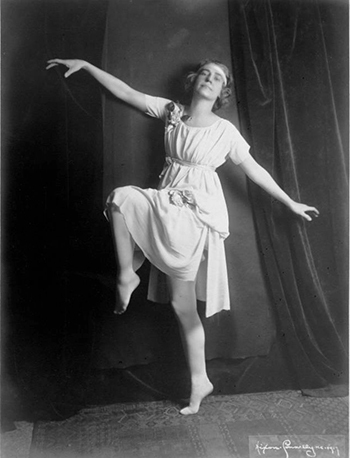 A year later, Miss Thomes got her diploma from the Castle School of Dancing in New York. She was one of the solo dancers at a garden party at the Dupont estate near Wilmingham, Delaware. She also sailed to Paris to study with the ballet master of the Paris Grand Opera in 1914. But she found conditions somewhat difficult, as Paris was under martial law and a state of siege had been declared. In a letter home, she described how all Americans had to go to the police station twice a day to register, how she watched two thousand soldiers march out of the city, and how few shops or restaurants were open. Still, she didn’t mention leaving, assuring her parents she was safe. 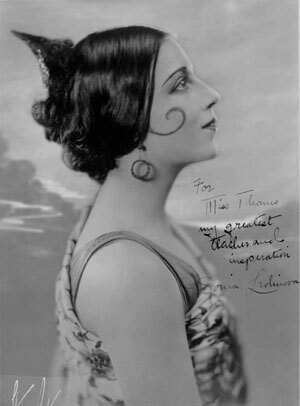 One of Miss Thomas’ best known dance students Beatrice Burk, who danced professionally under the name of Sonia Ledinova. This picture that she signed for Miss Thomes reads: “For Miss Thomes my greatest teacher and inspiration, Sonia Ledinova”. She danced internationally with the Anna Pavlowa ballet company. She was the daughter of Mr. and Mrs. H. L. Burk, 3630 Holmes Street. Photo courtesy Kansas City Public Library/Missouri Valley Special Collections. By 1917, Miss Thomes was leading young women in dance recitals, including at least one benefit concert for the National Surgical Dressings Committee. A newspaper review praised a concert that filled the Grand Theater to overflowing. “The willingness of the record local audience to sit through a program that as nearly three hours long on a hot afternoon was a high compliment,” it said. According to her obituary in the Kansas City Star, Miss Thomes began teaching about 1916, with her first studio in Morton’s Hall on the northwest corner of Westport and Main. She later taught at Drexel Hall at Linwood and Main and in Brookside. Then she built the studio at 40th and Baltimore where Pryde’s operates today. 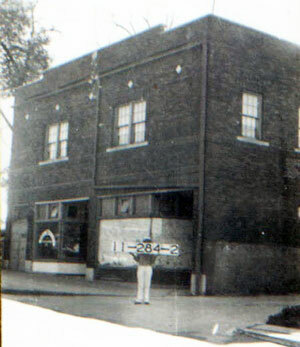 She also owned three stores at 3951-57 Main. A 1916 photo from Miss Helen Thomes’ scrapbook. The dancer is Frances Aikins, daughter of Mr. and Mrs. John H. Aikins, 4315 Warwick Boulevard. As part of our Uncovering History Project, the Midtown KC Post is taking a look at the 1940 tax assessment photos of each block in Midtown. This week we’re focusing on a small block in Westport near the corner of Main Street and Westport Road. (Many people seem confused by the tax assessment photos, which all include a man holding a sign. Here’s the story behind them). Do you have memories or more details about this block of Westport or Miss Helen Thomes? Please share them with our readers.